At the pace I’m writing these days, I’ll be posting my 2015 “Year in Delicious” retrospective sometime in early spring. So it goes… Onward! Following Chop Stick Nation, The Astronomer, June, and I drove to New York City for our first official family vacation. 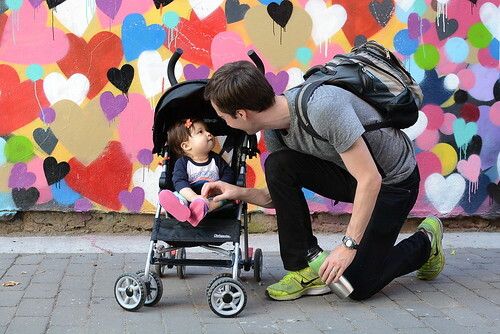 Traveling with June, 10 months old at the time, was pretty great because she was starting to take in her surroundings and appreciate little adventures, especially culinary ones. 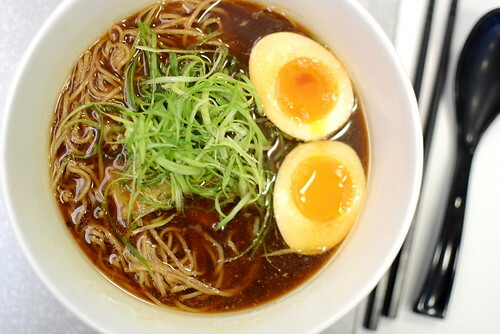 For our first meal in the city, we headed to Ivan Ramen for a late lunch. Ivan Orkin, a self-described “Jewish kid from Long Island,” made a name for himself in Japan prior to opening two outlets in New York. We had the restaurant all to ourselves at this hour. Before noodle slurping commenced, The Astronomer and I shared two starters. The L.E.S. 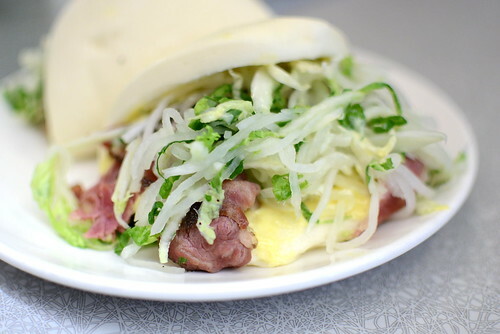 Bun ($11) paid homage to the restaurant’s neighborhood (the Lower East Side), stuffing pastrami in between steamed buns with karashi mayo and a daikon slaw. While the bun was plush and the pastrami well-seasoned, the mustard-infused mayo was sinus-clearingly potent and unfortunately dominated every bite. 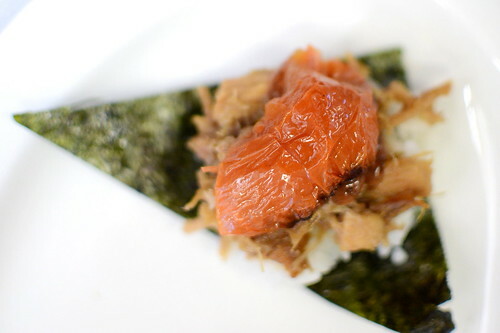 The one-bite Roast Pork Musubi ($7) with salted plum wasabi, roast tomato, and toasted nori proved to be an interesting combination of flavors and textures, and much better balanced than the buns. Moving on to the noodle portion of our meal, we shared the Tokyo Shoyu Ramen ($15). The broth, a combination of soy, dashi, and chicken broth, was light yet robust. Rounding out the bowl were rye noodles, pork chashu, and a soft-boiled egg. This was a simple and very good bowl of ramen. 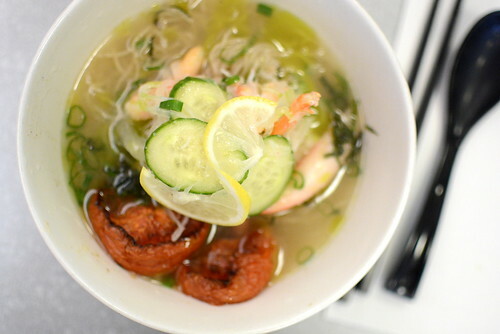 Even better was the Cold Lemon Shio Ramen ($14), one of the restaurant’s seasonal offerings. I loved how the chilled sea salt and dashi broth kept the rye noodles’ texture al dente from start to finish. We added fresh crab for an additional $5, which made the bowl even more delicious. The Astronomer and I enjoyed Ivan’s ramen very much, especially the awesomely refreshing seasonal bowl. June was happy that we added on the crab because it was her favorite bite of the afternoon. That baby has excellent taste. Who doesn’t love New York? 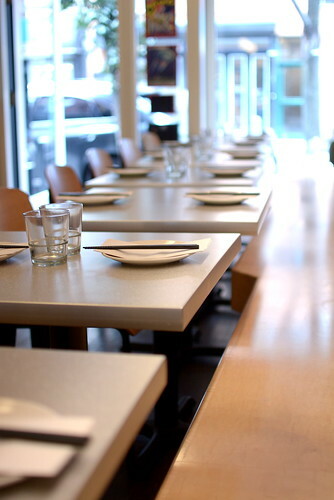 Good to read a review on Ivan Ramen. First heard of this guy through Keizo Shimamoto’s blog awhile back. Alas for me I just am not a fan of ramen be it in Japan or stateside. I much rather prefer the lighter southeast asian noodle soups. As for the sparse postings, it will get better when your little one gets older. Right now, they are just too adorable and fun to play with. And…it’s such a short time, make the most of it. I enjoyed the shio ramen when I tried this place in Tokyo. Wish I was able to try his pop-up at POT a couple months back but missed it. Darin – Wish I had made it to the pop up too! I am in bed by 9 PM these days, what’s your excuse? Really enjoyed your review! 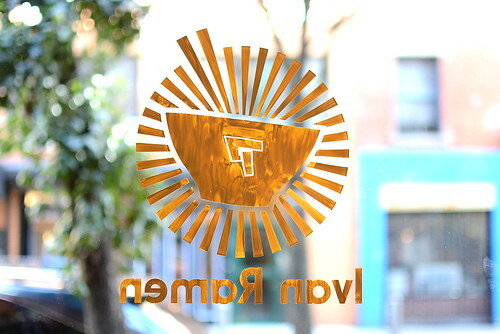 I tried and reviewed Ivan Ramen recently and found it to be a bit too salty and rich. I ordered the Chicken Paitan though. Next time, I think I’ll try the Tokyo Shoyu Ramen as it does look much lighter!